As I write this post I am hearing the sounds of hammers and drills one floor below me. My old kitchen is being disassembled and a brand new one will be put in its place. Since I believe the previous eating and cooking room would be a top contestant on an “ugly kitchen” reality show, I am thrilled. 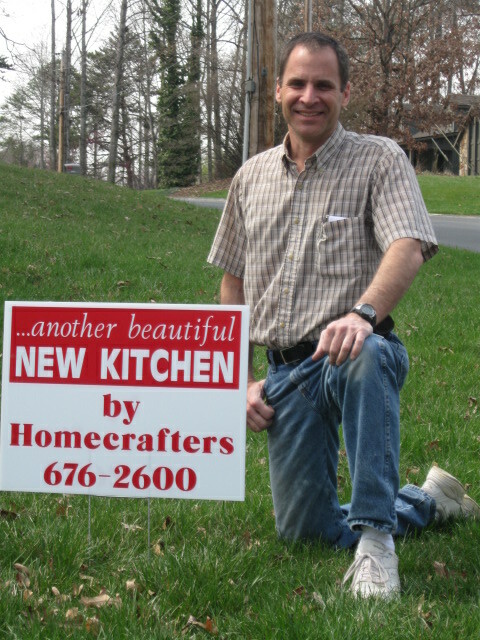 When Tom arrived this morning he had a shiny, new, professionally made yard sign. It says. “Another beautiful new kitchen by Homecrafters.” He asked if it would be OK to place it in my yard. I assured him that would be fine and commented on how smart he was to market his wares in a down economy. He agreed saying that in better economic times his work just poured in from the big box home stores. There was no need for him to “market” to the general public then, but now that work has slowed. Very good story. And I like your entire blog as well. You have a new reader. Thanks Jeff. I appreciate your support, as a fellow entrepreneur. I’ve been doing a lot of research into the marketing potential of social networks lately, so point #2 really resonated with me. This is exactly the value in social media. Think about Facebook apps – you add an app and it gets splashed all over your page first when you add it, then every time you use it. You friends see it when they’re browsing through Facebook (the online equivalent of the bike-by – just checking out the neighbors! ), they check it out, and might add it themselves. If they hadn’t seen it on your page/feed/whatever, the idea of it may never have even crossed their minds. Very cool post – got me thinking. Thanks! Thanks Erin. I appreciate the comments and am very glad that it got you thinking of the social media aspect of marketing. I am doing the same thing right now for a prospective client. Best of luck! I like this blog, I was always on the assumption that bragging was a no, no. But it is true, if you can back it up it’s not bragging! My spouse has worked with some of the greatest artists in the music industry and when he deals with new business, people introduce him as he’s worked with so and so and immediatley you will see the look on people’s faces once they relaize who he’s worked with, I felt uncomfortable at first whenever I would sit in on the meetings but after thinking about it and reading your blog, I realized that there’s nothing wrong with dishing your resume, especially if it’s true, it’s an accomplishment actually and there’s nothing wrong with being proud of your own accomplishments. Thanks for your comments Lisbeth. My parents always taught me “If you don’t toot your own horn no one else will.” I think there is a fine line between bragging and simply stating one’s accomplishments and then being able to back them up. Your husband’s work with the top music artists is a great example. That’s what he does and who he works with.